about 1/2 inch of Scotch tape made into a roll. The Alstroemeria, a relative to the Charmelia, is another flower with a long vase life. It can last as long as 3 weeks if you change the water out several times and follow the tips below. Floral Tip: To change the water out for this arrangement without having the rocks move around too much, slip the ribbon off. 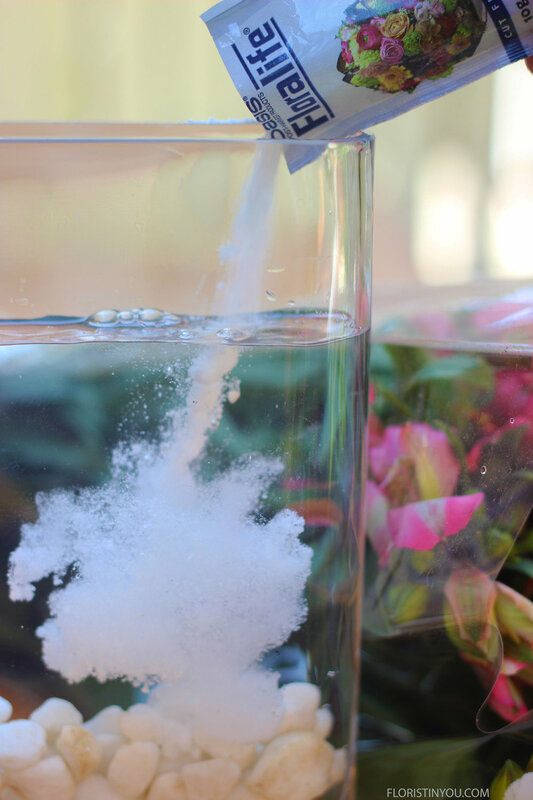 Put the vase in the sink and slowly add fresh water letting it over flow a few minutes until all of the water has been replaced. Tip the vase just enough to pour a little out. Then add a packet of floral food, which feeds the flowers and helps keep them fresh. Dry the vase and underneath the vase, then slip the ribbon back on. Ta da! 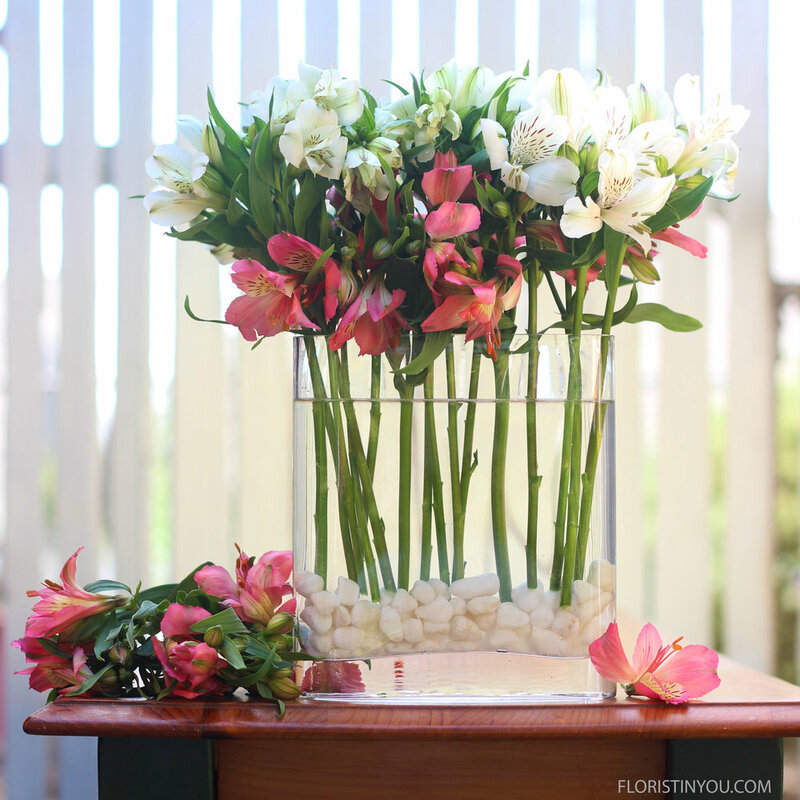 Floral Tip: Make sure to keep your Alstroemeria away from bananas and other fruit, as most fruit off-gas ethylene. Even so, bananas off-gas much more ethylene. Other fruit that off-gas ethylene are: apricots, avocados, blueberries, figs, grapes, cantaloupes, honeydew, kiwis, mangoes, nectarines, papayas, peaches, pears, persimmons, plums, tomatoes. 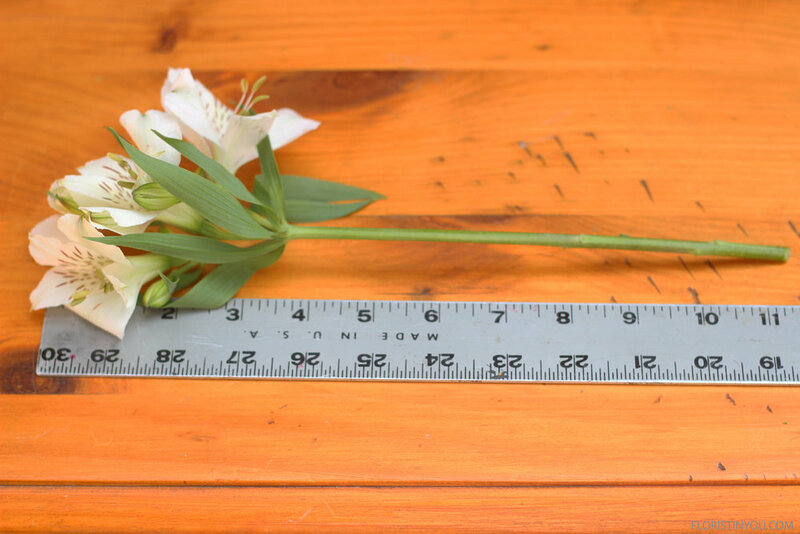 Alstroemeria is particularly sensitive to ethylene and it cuts its vase life short. You want to keep Alstroemeria out of direct sunlight, and heat or air conditioning in your home. Once you have your Alstroemeria and you supplies let’s begin. Here are you flowers and materials. Add 2 handfuls of rocks. Add water up to 2 inches below rim. Add 1 packet of flower food. Strip off all leaves below the water line. Cut six Pink stems at 10.5 inches. Cut four pink at 9 inches. Insert six pink stems cut at 10.5. Keep stems going straight down. Insert the white. Keep all stems going straight down. Put one pink 9 inch stem on each side, and one in front and one in back. Roll small piece of scotch tape. Put ribbon tails on a 45 degree angle. Tape top tail to vase.